Using coffee grounds in the garden is an economical and natural way to boost your growing power! 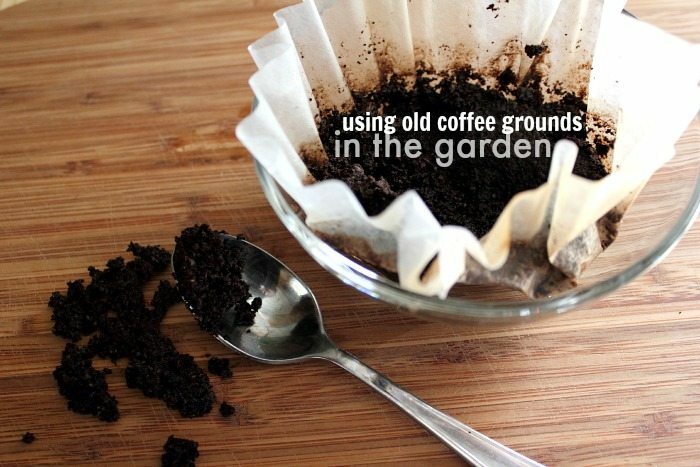 Check out some of these simple ways to get started using your old coffee grounds outside! Work the coffee grounds into the soil around tomatoes and corn, or sprinkle them on the soil around lettuce, beets, broccoli, beans, and peas to deter rabbits and squirrels. Sprinkle old coffee grounds on the ground around roses, azaleas, and hydrangeas to keep them extra happy. 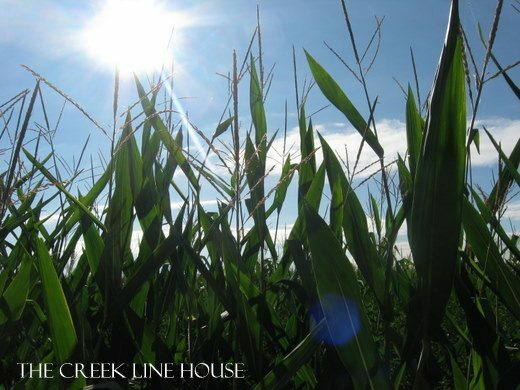 Make sure to keep the overall depth of grounds to less than 1/2 inch in any one spot to avoid mold and mildew. Putting used coffee grounds into the water that you use on little seedlings can give them a nice nitrogen boost and help them along. A mound of coffee grounds a couple of inches high around an afflicted plant can be a natural way to deter slugs and ants! When it’s time to come in from the garden, scrub your hands with used coffee grounds for a great deep clean, exfoliation, and to remove smells like onion and garlic. Do you use coffee grounds in the garden? Have any no fail tricks that we all need to know about? Share in the comments below! 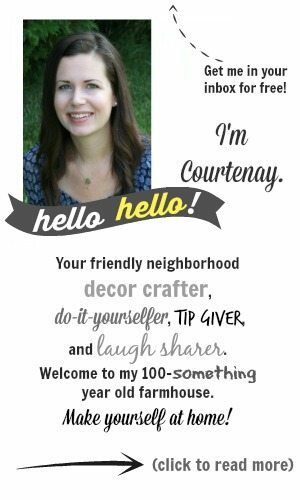 Or check out my gardening archives! I use coffee grounds by spreading them along my row of carrots. Apparently the dreaded carrot fly which bores holes into the carrot are attracted to the carrot by its smell. The odor of the coffee grounds will mask the carrot smell and the carrot fly will be unable to find the carrot. Can you use the Keurig flavoured grounds? I use the keurig pods, fill a 5 gallon bucket with water, poke the top with your finger and make a coffee brew. Just carry the water to your garden and let it steep in a warm location. Use a small watering can or cup to water with. I use coffee grounds to fill gopher holes in hopes to deter them from my yard. I also scatter them across the yard also in hopes to do something to detrr pests. The ONLY thing I’ve found that actually deters moles, and gophers is horticultural castor oil. Not the stuff you can get at the drug store. I get mine from Baar.com. I use an old blender and follow their directions, except that I pour the diluted mix (about a half gallon) into & around their mounds. I also poke holes in their tunnels about a foot apart and along the perimeter of our yard and pour about 1-2 diluted cups in each one. It doesn’t hurt them, they just can’t stand the smell! Note, if you already have mounds all over your yard start the treatment at your house, wait 1 week and move out a couple of feet, & make another ring around your house, wait a week, between treatments and work your way out to the edge of your yard. This will take several weeks, but it’s worth it. You don’t want them running away from the smell into your yard! It is also a fantastic to kill all June bugs, and their offspring (grub worms) since that’s what they eat. Nematodes are tiny critters that eat grubs, and other things you don’t want in your lawn. Don’t use insecticide if you’re going this route, or you will kill the zillions of nematodes you’re trying to keep! I add the coffee grounds to my compost, filters & all, the filters will break down just like anything else you’d put in compost. And it leaves you with less rubbish in your wastebasket! My husband starting sprinkling used coffee grounds around a newly planted maple tree. It’s grown tall and healthy, and fast! We take pictures of it every year on our daughter’s birthday and the changes are quite dramatic! Neat, Patti! Thanks for sharing! I can’t wait to get outside and get gardening again! Coffee grounds are also acidifying, so they’re good on Camellias and many other plants for which the water or soil could use pH lowering. My Leptospermums appreciate it, for example. Thanks so much for sharing your expert advice with us, Avra! I have no idea what a Leptospermum is, but I think I now need to find out! the acid coffee grounds are an old myth – the acid was in your coffee cup ,not in the grounds. better to compost the grounds first than to put directly in garden thinking it will change the acid. Studies by Cornell and Mass verify this. I like the gardening tips; here in Houston we alternate coffee grounds with mulched/shredded pine needles to acidify azaleas. My favorite tip lately is to sprinkle damp grounds on fireplace ashes before cleaning the firebox. It helps to keep the “air pollution” down and clean up goes faster. My husband puts his grilling ashes in my garden. He’s from the country and they always dipped their potatoes and things of that sort in ashes before planting them. I’m not sure the scientific reasoning for it but they say it helps the potatoes grow. I bet you could take some of the ashes that have the coffee grounds in them and do a double whammy for the garden. No scientific reasoning to back this, just an idea! My in-laws have been using ashes in their garden for two years now and their vegetables are greener and more abundant than before. So neat! I’ll have to clean out the fire pit in a few weeks when we do the garden! Keep any citrus peelings, chop them up finely with scissors, add your spent coffee grounds & mix together, sprinkle liberally around your plants & as cats hate the smell of citrus & coffee, they will avoid that area & go elsewhere to answer the call of nature! The peeling & coffee will biodegrade & enrich your soil & will also go some way to deterring aphids & slugs & snails, and all without harming our feline friends! That’s a great one, Dee! Thanks for sharing! I’ve used citrus peels to keep cats out of cut flowers before too! Oh this will be fantastic for all of the feral cats our neighbor has decided to feed and to keep them out of my garden soil. Any idea as to whether this will work for dogs? I would love to find something to keep our dogs out of things without having to fence off the area where the new plants are. Cats love the loose soil in a garden to use as their “potty”…but they do NOT like coffee grounds, so I sprinkle my extra grounds all around to keep the neighborhood felions from using my garden as their depository. Well i have tried coffee grounds in my garden and it has not stopped this one cat i have coming everyday to do his business. Next i will try the citrus fruit and the cayenne pepper. The cats don’t have a chance because the garden is so crowded with squirrels and rabbits who are munching away on everything growing except weeds. wil coffee/coffee grounds help or hurt a spearmint plant? Any & all help will be most appreciated. Hi there! I find that using coffee grounds on indoor plants can be a little tricky because they sometimes don’t dry out quickly enough and the grounds can then start to mold. Mint plants are usually really aggressive and grow like weeds so it’s strange that yours is having some trouble. Is moving it outside an option? I live in an apt so moving it outside is not an option. This is my first houseplant so I really new at this…. I killed every plant I tried to grow, Until I read this article that talked about soils. I tried it and was so surprised how well my plants have grown. It included a mixture of potting soil, vermiculite, peat moss, perlite, and orchid soil. You mix them together and it helps the plants roots get oxygen, and keeps the roots from becoming compact. I dry mine in a warm oven in winter. I keep a jar of grounds in the frig for spring planting. My blue spruce tree was dying until I started sprinkling my coffee grounds around its base . Now it is beautiful blue and happily growing. We do a lot of gardening,vegetables and flowers and we have won a lot of beautification awards in our town. We are seniors and we do it ourselves, for how much longer we don’t know. We enjoy what we can do and when we get rewarded we feel really good. Hi… we live in an area where them cats seem to be everywhere. Thus my flower bed / garden is their favorite bathroom! Solution….used coffee grounds! Worked immediately! I have used coffee grounds for many, many years in my flower and veggie gardens. To keep cats from using my flower gardens, I slice or chop up lemon or lime or orange peels and scatter in the garden. Cats do not like the smell of citrus fruits or coffee. I have beautiful gardens now and no cat or animal uses gardens for their bathroom. I also dry out the coffee grounds for a day before putting in gardens, this prevents mold from forming and causing other issues. I just place used coffee grounds in filter ontop of a paper towel and let dry for a day. Thank you all for posting wonderful tips for gardening.